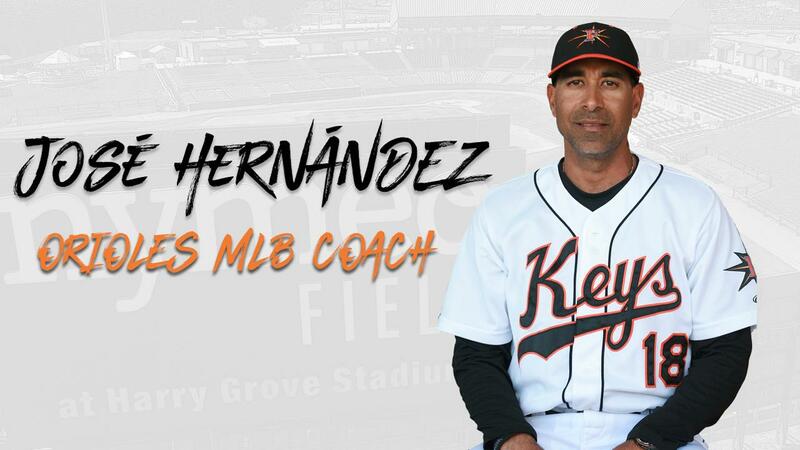 FREDERICK, MD- The Orioles new Major League coaching was named on Wednesday and former Frederick Keys Hitting Coach, José Hernández, was among those named to the staff. In addition, Howie Clark, who suited up for the Keys in 1994, returns as the club's Assistant Hitting Coach. The duo will be part of a largely new MLB coaching staff led by first-year manager Brandon Hyde. Hernández, 49, begins his 10th season in the Orioles organization and his first on the team's Major League staff. Hernández will serve as a Major League Coach. He spent the previous six years with the Triple-A Norfolk Tides where he served as the team's Field Coach and Third Base Coach. The Puerto Rico native also spent time as a minor league hitting coach with the Keys (2012), Low-A Delmarva Shorebirds (2011) and served as the Field Coach for the GCL Orioles in 2010. With the Keys in 2012, Hernández worked alongside his father-in-law, Orlando Gomez, who served as Frederick's manager that season. Retiring in 2016, Gomez ranks as the winningest manager in Keys history, tallying 278 victories. Playing in 1,587 Major League games over 15 seasons, Hernández finished with a career slash line of .252/.312/.418 to go with 168 home runs and 603 RBIs. His 168 home runs rank 17th-most by a Puerto Rican-born player. Hernández's best season came in 2002 with Milwaukee when he batted .288 with 24 home runs and 73 RBIs in 152 games and was named a National League All-Star. As a big leaguer, he spent time with the Cubs, Brewers, Pirates, Indians, Rockies, Phillies, Braves, Dodgers and Rangers. Texas originally signed Hernández in 1987. Entering his third season on the Orioles Major League Coaching staff, Clark also begins his fifth season as an Orioles coach. Before joining Buck Showalter's staff in 2017, Clark spent time as a minor league hitting coach in Delmarva (2015) and Double-A Bowie (2016). Originally selected by Baltimore in the 1992 draft, Clark played 18 pro seasons. This included 134 Major League games between the Orioles, Blue Jays and Twins across six seasons. Earlier this offseason, former Keys Hitting Coach (and player) Paco Figueroa was hired as the First Base Coach and Outfield/Baserunning Coach for the Philadelphia Phillies.